Here are some really fun and interesting cleaning hacks for your whole house. These little hacks if you want to call them, will be a neat new way to clean your home, you might not have thought about! They are little tips and tricks I have learned along the way. 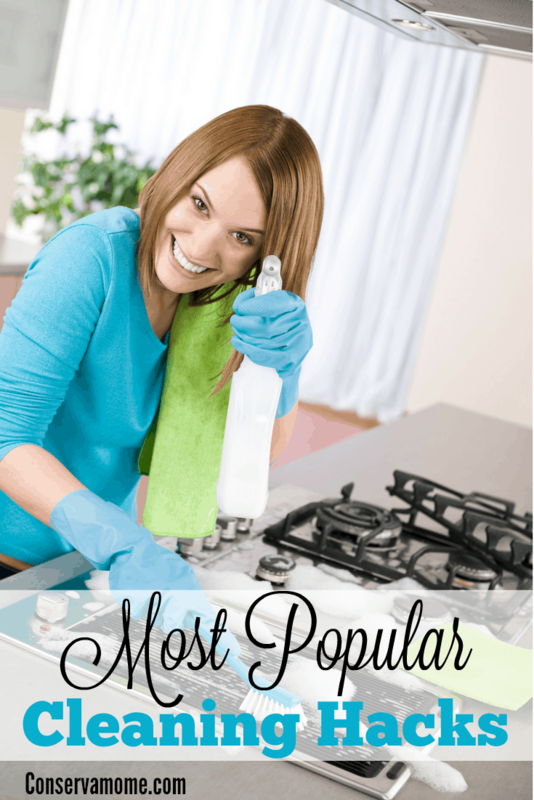 They are the most popular cleaning hacks that will make life easier for you! Cleaning isn’t always a ton of fun, but I find when you learn new hacks those can be fun to try out. It is a new way of cleaning something so it makes me a little excited for a change. So keep reading to learn of all these cleaning hacks you will want to try out! From cleaning your shower head to using a lemon and salt to clean your cutting boards! Cabinet Gunk Remover: Here is a DIY gunk remover that you can use to clean on stuck on grease on your cabinets. You ever touch the cabinet and find it to be a little sticky, well here is a trick for you. Mix one part vegetable oil and two parts baking soda. Mix the paste and grab an old toothbrush and scrub! Natural Drain Cleaner: Here is a fabulous DIY drain cleaner, you first start with a pot of boiling water. Pour that down the clogged or slow moving drain. Then pour 1/2 cup baking soda, and next 1 cup vinegar. Let that sit for 15 minutes, and then pour another 2 cups of boiling hot water down. This will help break down gunk in the drain and get things moving. Use Socks for Swiffer Pads: If you own a swiffer you know the replacement pads can add up in cost. Instead grab an old sock and use that as the pad. You can wash and reuse! If you don’t have old socks head to your dollar store for some cheap ones! Clean Your Cutting Boards: Here is a great DIY for cleaning your cutting boards. Pour a good amount of salt onto your board, then cut a lemon in half and scrub. Use the lemon as a sponge and the salt will work deep into the cutting board to get yucky stuff removed. Then wash with a little soap and rinse! Do this as often as you would like. Shower Head Scum: Ever look up to a slow stream on your shower head or see soap scum building up. Take a gallon size bag, put equal parts of water and vinegar in it. Place the bag with the mixture over your shower head and then use a rubber band to secure the bag in place. The water/vinegar mixture will begin to eat away the soap scum. This is a great hack if you can’t take your shower head off. Clean Blinds With Tongs: That is right grab a pair of tons and wrap a cloth on each tong and secure with rubber bands. Then spray some cleaner on rags and clean your blinds. You can push down a little and watch the cloth pick up all the dirt and dust. Clean Microfiber Couch and Chairs: If you have a microfiber couch, here is a way to get it clean! I do recommend testing this on the back part of furniture just to ensure it doesn’t have any reaction and ruin your furniture. All you do is put some rubbing alcohol on your spots that need cleaned, and with a stiff bristle brush scrub. That is it, and it will get your furniture looking like new. Pillow Cases to Clean Ceiling Fans: One of my favorite hacks is to place a pillow case on to one of the fan leaves and wipe away the dust. All the dust bunnies will fall into the pillow case instead of falling to the floor. You can use cleaners as well with this process. Just do the blades one at a time and then shake out all the mess. Clean a Popcorn Ceiling: Here is a neat trick, if you have popcorn ceilings. Take a high nap paint roller and run that over your ceiling. It will pick up dust and such but gentle enough not to ruin the ceiling. No cleaner needed for this hack. As you can see there is a hack for almost everything! You just got to get creative and think out of the box! I hope you enjoy these cleaning hacks, and if you have a fun one make sure to share it! Those are some great hacks. It’s nice to know what can be accomplished with natural cleaners. Oooh I need to do all of these and more!! Thanks so much for the awesome tips!! I had never heard of any of them!! I like the pillowcase hack. I have to try that soon. I’ve used the drainer and shower head tips before. Vinegar is great! These are great tips. I need to get started on my spring cleaning, so this is helpful! Always looking for cleaning hacks! I’ll try the pillow case and lemon/salt hacks.